Pacific Northwest National Laboratory's Dr. Julia Laskin received the U.S. government's highest honor for researchers at the start of their career. She accepted the Presidential Early Career Award for Scientists and Engineers in Washington, D.C., on November 1, 2007. "Julia is an outstanding scientist here at PNNL," said Associate Laboratory Director for Fundamental and Computational Sciences Doug Ray. "We are honored to have her expertise and enthusiasm in advancing scientific frontiers." A chemist, Laskin was honored for her leadership in the field of gas-phase ion chemistry and mass spectrometry of large complex molecules. Her work is critical for the development of analytical techniques for improved characterization of synthetic and natural polymers, petroleum, biofuels and other complex samples. PNNL's Dr. Julia Laskin was among the researchers honored with the 2006 Presidential Early Career Award for Scientists and Engineers in Washington, D.C., on November 1, 2007. 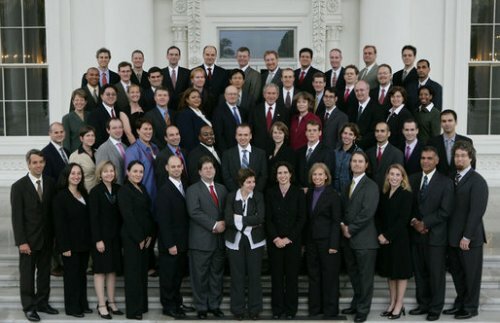 Laskin, wearing a red jacket, is near the center of the photo, directly next to President Bush. Her internationally recognized research in fundamental reaction kinetics and ion surface reactions provides a basis for tandem mass spectrometry of high molecular weight compounds and preparation of novel biomaterials. She has co-authored more than 70 peer-reviewed articles and co-edited the book Principles of Mass Spectrometry Applied to Biomolecules. In addition, she is active in professional societies and educational endeavors. Laskin started at PNNL as a postdoctoral research associate in the U.S. Department of Energy's Environmental Molecular Sciences Laboratory, a national user facility at PNNL, in 2000. She completed her doctoral degree in physical chemistry at The Hebrew University of Jerusalem. She has been a research scientist with the Lab since 2003. "My career has been an interesting journey," said Laskin. "And I've been fortunate to have worked with two people who really shaped my scientific career: Chava Lifshitz at The Hebrew University of Jerusalem and Jean Futrell at EMSL." Each Presidential award winner received a citation, a plaque and a commitment for continued funding of their work from their agency for five years. Laskin was one of four DOE Office of Science funded staff members receiving the PECASE award this year.